I hear the sounds of bombs and killin' everywhere, cause this old Granny has those eyes that sees the world and hears everything that happens no matter where they is. And Granny never talks twice for you on every single day, but today it is important 'cause sometimes other folk don't tell you what you need to know that's happening right now. I've watched and listened carefully and took my time with this. I hear the quarrels everywhere, the people talkin' hate. Where Granny preaches love today; some others talk in angry ways, and some they hurt and kill. And that's what happened you should know so you don't always worry that everyone who's different is someone you should fear. Granny, she loves everyone, no matter what their Faith, but she gets very angry when they gets actin' like they is better than anyone else and starts hurtin' other folks who don't believe like them. She knows that people look for The Man Upstairs in every way they can. But some folks think theirs is the only way, and so they get real mad when anybody's different.. It happens even down the road where some churches don't get along, where one preacher says he's better than someone else or his church is better too. But maybe there are many ways to get to The Man Upstairs, and maybe that's why we each have thinkin' caps for every person's head. The problem gets to be when we don't put them on. 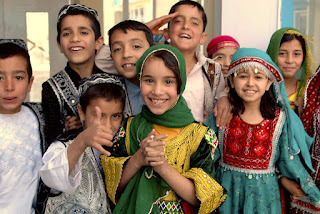 In Afghanistan, a country far away from Cloutierville, a little tiny Muslim group called Hazara, were just walkin' peaceful like and some bad people started shootin' and killin' these poor folk. Granny heard the little ones, cause they was very scared. Their mommies and daddies fell on the ground, and the babies left alone. And some of the babies they was killed by very bad, bad folk just because this little Muslim group was different and wanted to be, and they is peaceful people who don't like fightin' and all. But people who think their ways is better and want to be in charge, that's sometimes what they do to get their way. And it is now too much. Now why is Granny tellin' you here in Cloutierville? Cause here in this town we have peace and love and good, we know each day and are the place that people love and want to be like us. But we is part of that big, big world and cannot think that everyone in the same religion is all alike. Cause some are bad and some are good, just like we learn at school. So think about The Man Upstairs and what he wants of us. He wants us to be prayin' for all those hurtin' folks, just like they was in our backyards, our neighbors here at home. And light a candle everywhere, just like old Granny does, to show where there is darkness, there is always love and light, so people come to see it and know they's comin' home.